With large plantation windows facing the street to the right, Brannan’s Grill is a comfortable, upscale spot for lunch, dinner in Calistoga. 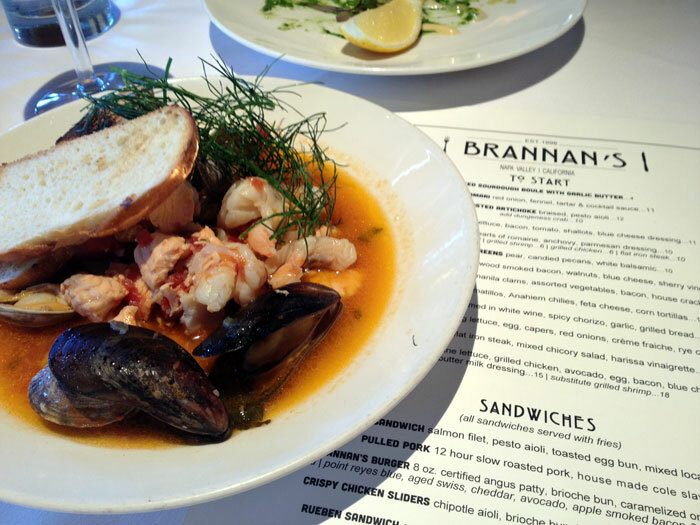 My wife, Geena, and I were fortunate to enjoy lunch at Brannan’s Grill in Calistoga, California, in late June. There we met a friend, local resident Peter Stetson. As we entered, a hostess greeted, smiled and led us to a booth in front of one of the large plantation-style windows overlooking Lincoln Ave.
Brannan’s decor creates anticipation and an expectation of a top-flight meal. The main space is wide open with wood beams and a pitched wood-planked ceiling. An elk trophy hangs above the large stone fireplace at the back of the raised center dining room. Large area photographs and drawings help create a historical tie to the the 19th century western town made famous by spas and the 1976 Paris Tasting. The large mahogany bar can seat at least 12 and its staff carried on lively conversations with locals and walk-ins alike. Our meal started with a couple of roasted artichokes. They were braised, had great smoky flavor on their own, but the bed of pesto aioli was to die for. I love artichokes and Brannan’s version kept me thinking of an old Lays potato chip commercial: “Bet you can’t just eat one.” I confess, I ate more than my share. 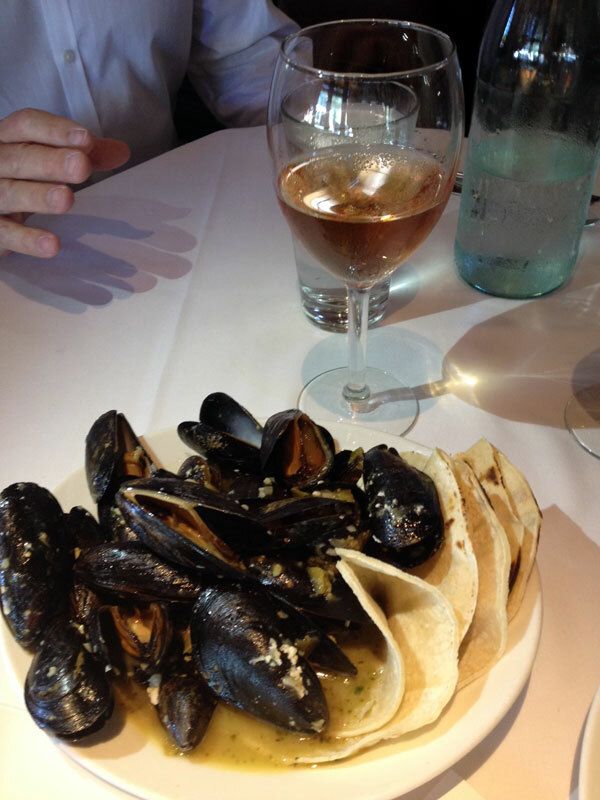 A glass of Sonoma County Iron Horse Pinot Noir Rosé complimented a bowl of lightly seasoned mussels. The waiter suggested an Iron Horse Pinot Noir Rosé from the Russian River. The Sterling family out of Sonoma County creates wonderful wines and this one was perfect. This rose petal pink version is a bone dry, 11.8% alcohol, delicate Rosé. After an initial taste, the nose was watermelon and strawberry with a hint of lime. However, in the mouth, green apple became prevalent, but not overpowering the crisp watermelon flavors. This wine is perfect for lighter fare, including our artichoke and bowl of lightly spiced steamed mussels. The perceived sweetness of the Rosé, its low alcohol and structure helped cut through the pepper flakes and spice of the bouillon and fish. A nice foil for the lunch dishes. The seasoned mussels had chopped tomatillos, Anaheim chilies, feta cheese mixed in a light salsa. The bowl was just big enough for four to enjoy as an appetizer, especially since we had already picked clean the artichokes. Corn tortillas were also provided, but I choose to fork out my share of the seafood. I must say the poor reviews listed on Yelp did not materialize on our table. The hostess, waiter and staff were pleasant and quick to check on refills. After making suggestions, the waiter delivered our two appetizers to table, allowing us to finish one of the two artichokes before bringing the next one, still warm. The mussels arrived before the second ‘choke was gone. Water glasses were refilled and the waiter seemed genuinely happy we chose Brannan’s for lunch. 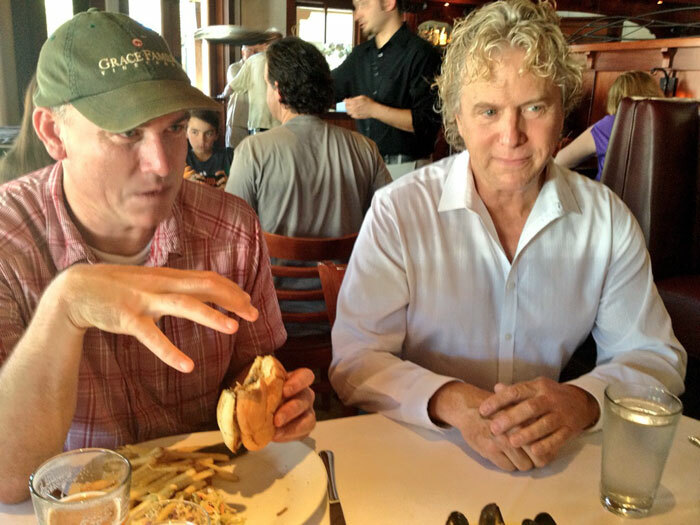 Local resident Peter Stetson, left, and Brannan’s owner Mark Young share personal passions and stories of Calistoga during lunch. Perhaps the staff was extra attentive this day or maybe they were “on their game,” but I was pleasantly surprised to enjoy the company of one of the two owners, Mark Young. Mark was wandering through, chatting with the patrons and stopped to say hello to Peter. Evidently though, he is often in the restaurant doing much the same. Mark quickly became warm and friendly and he chatted about the town, restaurant, day spas and mud baths and recreational opportunities in the area. In fact, he began to share his passion for a once-a-year trip to the desert of Black Rock Nevada called Burning Man. It’s a city in the desert, dedicated to radical self reliance, radical self-expression and art. His passion for community, sharing gifts unconditionally and self discovery was impressive. He was quick to share via his iPad and I learned much about his fervor for living as a restauranteur and community spokesperson. Just before we finished the mussels, our entrees arrived. Mine was one of the specials of the day: Cioppino. The seafood soup (bouillabaisse) consisted of clams, mussels, salmon and shrimp. I must say I was impressed not only with the Cioppino but with the toasted garlic sourdough bread as well. My wife was surprised I went back to a seafood dish but I heard the San Francisco-based famous seafood stew was special here. The lightly spiced, tomato bisque was gorgeous. Be sure to check with the server as to what the chef includes in this dish as the best Cioppino always relies on fresh ingredients. With a spiced tomato bisque base, I used my toasted garlic sourdough bread to soak up all of the San Francisco-inspired Cioppino. While my visit was during lunch, call the hostess a head of time or find out if Brannan’s Grill is featuring a local artist or musician during the dinner hours. This touch adds class to a weekend date. Often Saturdays are smooth jazz nights and other evenings may include local guitarists. The buzz on the way out from a couple of bar patrons stopped me. “Have you tried a Carlos Lemon Drop? – the best in NorCal!” I shrugged my shoulders and smiled. I should have known to stop at the bar first. 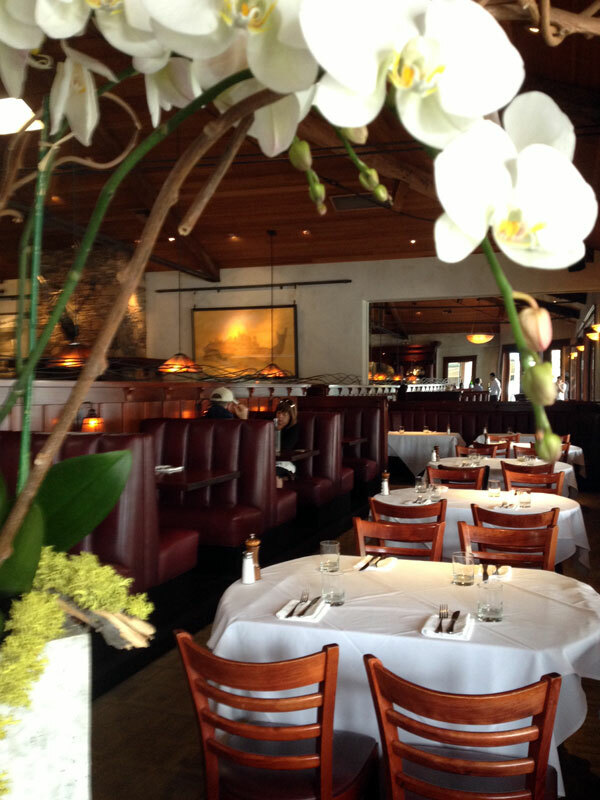 Brannan’s Grill is located at 1374 Lincoln Avenue, Calistoga, California 94515. They can be reached via their website, Brannan’s Grill, via phone: 707.942.2233 or by email: mark@lcrestaurants.com. Social media folks can catch them through Facebook: BrannansCalistoga or through Twitter: BrannansGrill. For my previous post, check out TalesoftheCork.com and the Tuscan tasting: Castello di Amorosa 2012 Rosato.